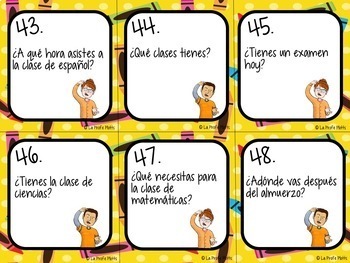 Give your students lots of practice of school vocabulary and talking about school in Spanish with this task card set! This set has 48 different cards to get your students up and moving while reinforcing their understanding of school vocabulary like school supplies, classes, and verbs commonly used when talking about school. 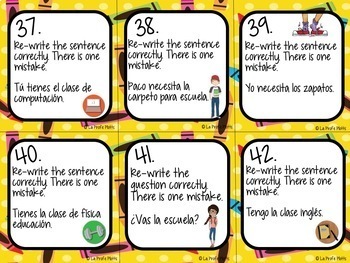 Students will be engaged as they complete various tasks on the included response sheet like identifying supplies and classes in pictures, filling in the blank with the missing form of verbs, writing sentences about school from the prompts given, answering multiple choicequestions, conjugating the school verbs TENER, IR, ESTAR, NECESITAR y ASISTIR A, and fixing the incorrect sentences. 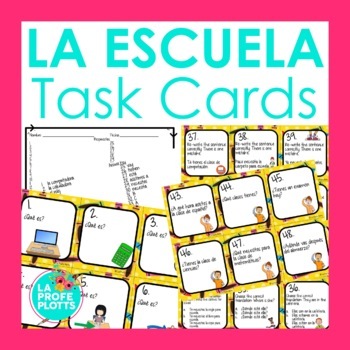 If you like this task card set, click the links below to check out some of my other task card sets! 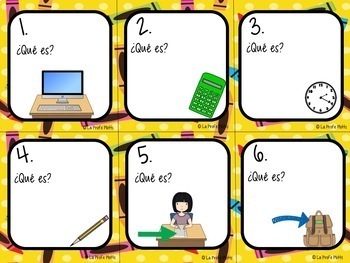 Thanks for checking out my task cards!